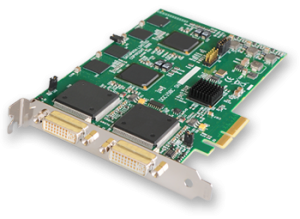 The VisionRGB-E2S, a stand alone PCI Express x4 plug in capture card, delivers extreme performance with 650MB/s transfer bus bandwidth providing a further improvement to the 480 MB/s of the VisionRGB-E2. This video capture has two complete capture channels supporting up to 1920x1200 DVI or 2048x1536 Analog resolution. The VisionRGB-E2S capture card is supplied with a powerful software application for configuring timing and format of the input sources and displaying the data. Simply connect your external DVI or Analog source into the card, run the VisionRGB-E2S application to automatically detect the video source format and display the captured video in a window on your desktop. VisionRGB-E2S: Dual channel RGB/ DVI/ HD capture card, PLUS 2 x DVI/VGA, 1 x DVI/ component and 1 x DVI/ HDMI adapters.